Stadia is Google's new gaming service that promises latency free 4K quality streaming of AAA games to any device that can run the Chrome browser. The new product offers some interesting gimmicks, such as easy sharing to YouTube and integrated Google Assistant. Can Google make space for itself in the lucrative but entrenched gaming market? It has a chance, if it makes the right moves. A subscription model in which users don't buy games but instead pay monthly accesses a full library of titles, i.e. that Netflix of games everyone's talking about these days. Google's own game store a la Steam, Epic Store, Origin, etc, through which users can buy individual games. Of the two, a subscription model will likely be more attractive to users, even it means Google will have to invest more into licensing a tempting enough roster. The ability to just pick up and play a game you like, or one that was just shared on YouTube in a 'save state', without being interrupted by having to make a purchase is what makes sense for Google's convenience is king pitch. The pricing of a subscription model will probably be somewhere between $15-$20 a month, to stay competitive with PlayStation Now ($20/month), Xbox Game Pass ($10/month), Shadow's high-end streaming service ($30/month) and indeed, Netflix itself, which has identified video games as one of their main rivals for consumers' attention. A $15 or $20 monthly fee saves a bunch compared to buying a home console or gaming PC along with several $60 games a year. Of course, it needs to have the games you want to play. Google became the giant it is today through offering effective, well-integrated, convenient services like Chrome, Gmail, maps and so on for free. I've no doubt that the company can make a service that's user-friendly and smooths out many of the hardware hurdles between game purchasing, loading, sharing, and streaming. Getting and playing a game in one tap after seeing its trailer on YouTube? Sounds great, but that won't mean anything unless it has the right games on it. So far we've only got Doom Eternal confirmed for Google Stadia, a title that's also going to be on every other major platform. And while I'm always happy to see somewhere else you can play Doom, it's not the killer app it used to be, so Google will need more than this to carry its platform. Will we get more titles like Ubisoft's Assassin's Creed Odyssey, which Google used to test Project Stream? Stadia-exclusive titles will be produced by Stadia Games and Entertainment, a new in-house studio headed by industry veteran Jade Raymond (Electronic Arts, Ubisoft). 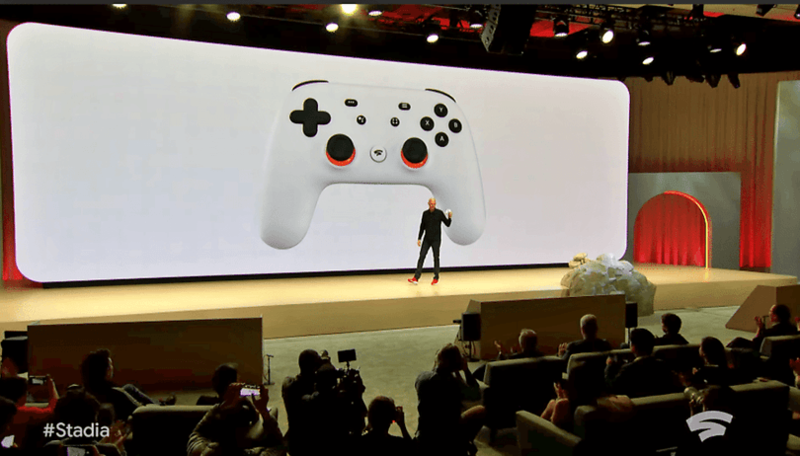 Google says more than 100 studios already have dev kits for Stadia, and more than 1,000 creatives and engineers are already working on Stadia-compatible titles. A killer exclusive title that everyone will talk about (and presumably, share all over YouTube) would have been the best way for Stadia to kick off. And sadly, it didn't. But Google does have both the clout and the cash to come up with something good, and it looks like it has the talent on board too. Will Stadia get a God of War or Mario Kart style megahit to be its flagship franchise? If it can come out swinging with one at launch, that could make all the difference. Is streaming the future of gaming? Emphasis on future, because right now, 5G fantasies aside, many people in the present day do not have a good or stable enough Internet connection for this to be feasible. Google has outlined that Stadia will require "approximately" 25Mbps download speeds to deliver 4K streaming at 60fps. If your Internet isn't up to scratch, and there's a good chance it won't be, depending on where you live, then the resulting latency may be unbearable in fast-paced competitive titles, though slower games such as turn-based strategy titles won't suffer much. This is going to be a deal-breaker for many though...either your connection is good and Stadia could be a viable option, or it just won't be. There's also the issue of how operators will treat game streaming platforms now that net neutrality regulations aren't an issue. No one will want to pay extra to their operator just to use Stadia. I'll admit right away, I'm not in it. As a PC gamer who's invested heavily in hardware and enjoys modding and also playing older games, the idea of a Netflix style service where games could be yanked out of my library at Google's whims, or can't benefit from mods or be played offline doesn't appeal. But I do know people who this could be just right for, in theory. Plenty of people get excited for new games, love watching trailers and streams of these games on YouTube, but they don't have the hardware to run them. Perhaps they bought the wrong console or just didn't upgrade to the latest gen, or just have other priorities to their spending. But, at a low investment, they can buy Stadia and impulse-play these games straight from the video that they're viewing on their smartphone, TV, laptop, etc. Almost everyone has at least one device that can use Chrome, and thus Stadia. But, there's another thing to consider. Let's face it, consumers have good reason to be afraid to bet on a new Google product. The company has a history of abandoned projects. We're about to say goodbye to Inbox on April 2, and it can't help bring to mind the fear that Stadia will be hyped up initially only to be dropped in a couple of years. Is Stadia the next Google Glass? Google has enough money to afford to fail big and keep going, but for consumers to take a chance on Stadia, it had better be very, very cheap and very convenient. Because it's Google that has everything to prove in this case, and we'll be paying with our data anyway. What do you think of Stadia? Do you think it will succeed or be another one of Google's flops?